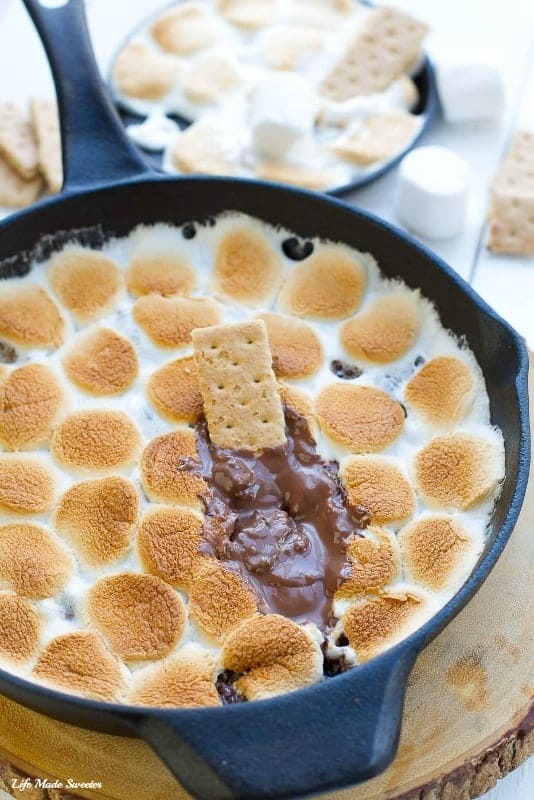 Easy Indoor Skillet S’mores Dip – 3 Ways makes the perfect summer treat! 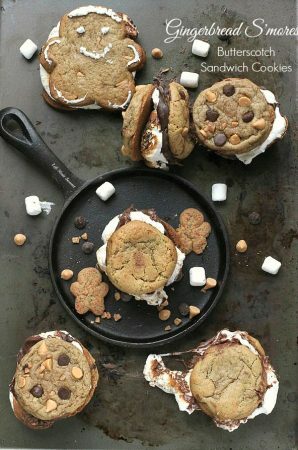 Best of all, it’s SO easy to make with only 3 ingredients each and you get the classic taste of S’mores without the need for a campfire! 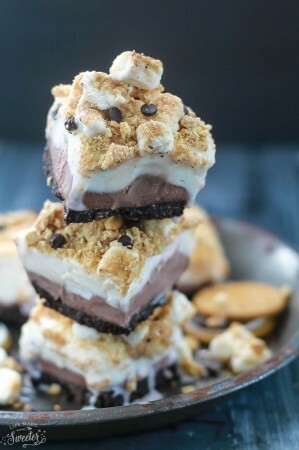 Pin for later AND follow my Recipes Board on Pinterest for more drool-worthy treats!I love anything S’mores and can have them all year round but there is just something about them that totally screams summer. 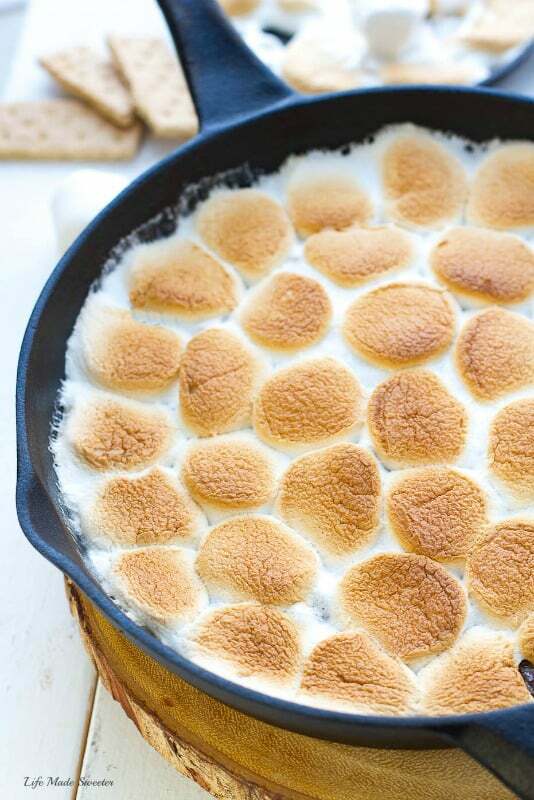 I’ve been seeing a few versions of a S’mores Dip all over Pinterest and have wanted to try making one for a while but never had the chance. Then I saw this version on Pillsbury which used Reese’s Peanut Butter cups which is like the best chocolate ever and the hubs absolute favorite. And I just couldn’t wait to make my own version for some friends we were having over. You guys, they were seriously amazing and a total hit at our guests! All three versions were winners and when I asked which version was the best, nobody could choose a favorite. 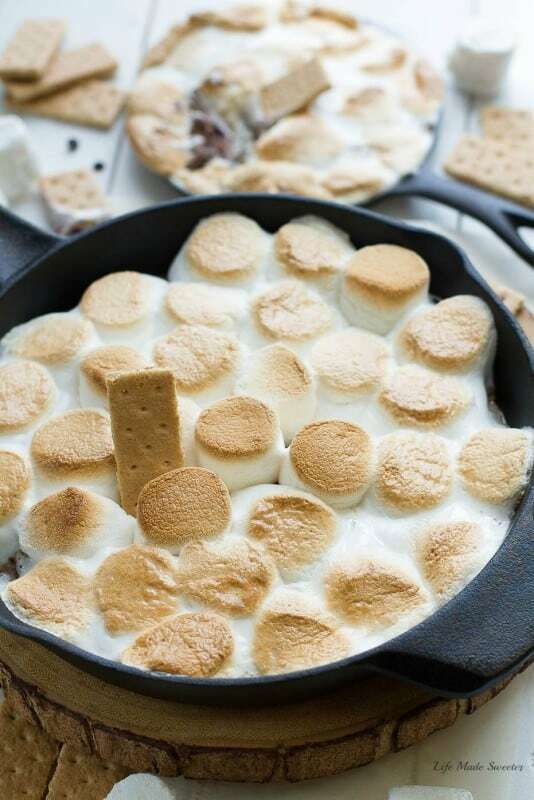 This Easy Indoor Skillet S’mores Dip starts off with either a cast iron skillet or a cake pan with the bottoms and sides greased well. Fill with your favorite chocolate or chocolate chips along with heavy cream. It’s hard to mess up the proportions, just fill according to how big your pan is. Peanut Butter Cups plus min semi-sweet, peanut butter chips and heavy cream. Chocolate Chips – I used mini semi-sweet chocolate chips and heavy cream but you can use any combo you like e.g. dark, semi-sweet, milk chocolate etc. Chocolate Chips + Caramel Bits and soft caramel chews or use Rolos plus heavy cream. 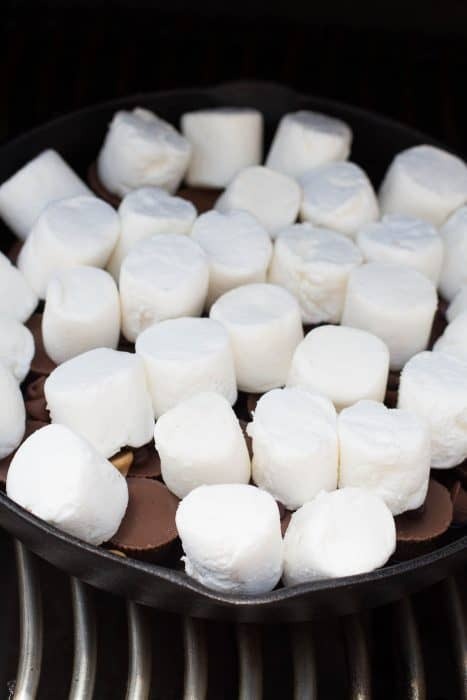 Place the pan in the oven for about 5 minutes so the chocolate melts then remove and top with marshmallows….and again, you can use jumbo or minis – totally up to you. Then you place the pan back in the oven or toss it on the grill until the marshmallows get nice and brown. 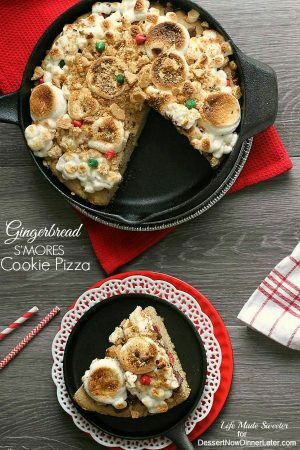 Just be sure to watch this bake carefully and remove the skillet from the oven once they are nicely toasted because the marshmallows can burn in just seconds. An easy dip made 3 ways with the classic campfire taste of S'mores. Use your favorite chocolate and marshmallows for an ooey gooey treat made in the oven or on your grill. Place skillet or cake pan in center rack of oven. Preheat to 425°F leaving skillet inside. Remove skillet and pan from oven using an oven mitt. Grease with softened butter or spray with baking spray. Snip the large marshmallows in half. Set aside. 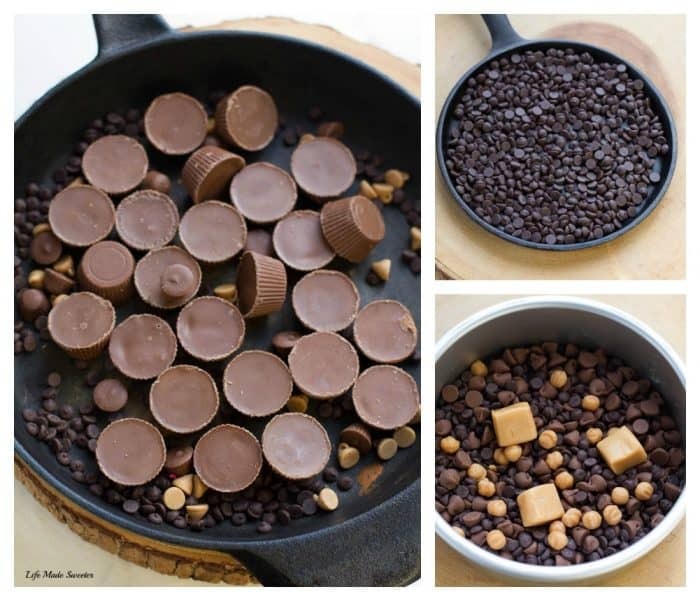 Fill skillet or cake pan with chocolate combination of your choice along with the heavy cream. Bake in the preheated oven for 3 minutes or until chocolate softens up. Remove carefully from oven using oven mitts and place onto a heatsafe surface. Place an even layer of marshmallows on top of the chocolate chips. Bake for an additional 6-8 or until the marshmallows turn golden brown - watching closely near the end in case the marshmallows burn. Remove from oven and allow the skillet / pan to rest for 3-4 minutes before serving with graham crackers. Preheat grill to approximately 350°F. Place a larger pizza stone on the rack to preheat for at least 30 minutes with top of grill closed. Snip the large marshmallows in half. Set aside. 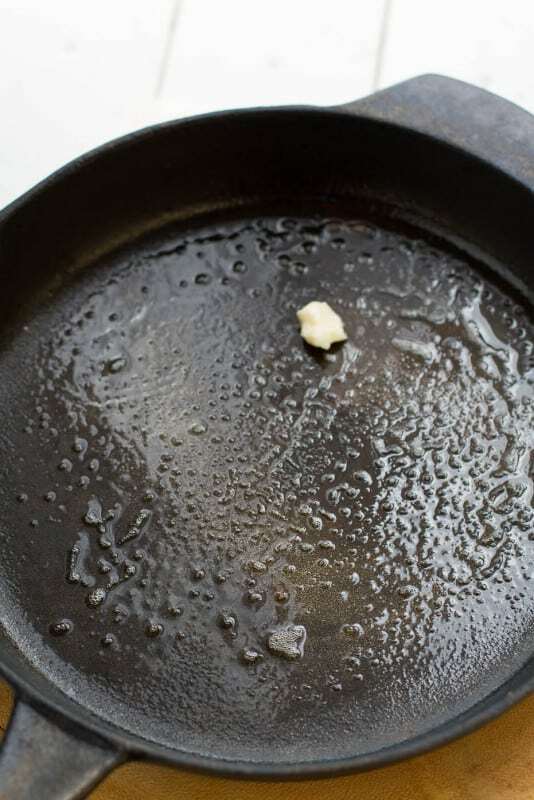 Grease skillet or pan with softened butter or spray with baking spray. Fill as desired with chocolate combination of your choice plus heavy cream. Place pan on pizza stone, close grill and bake until chocolate has melted slightly. 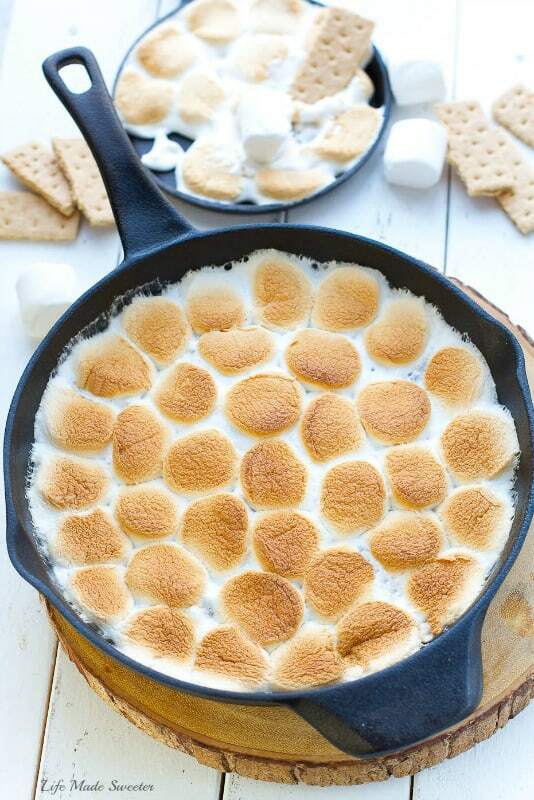 Remove from grill and place an even layer of marshmallows and return pan back to the grill. 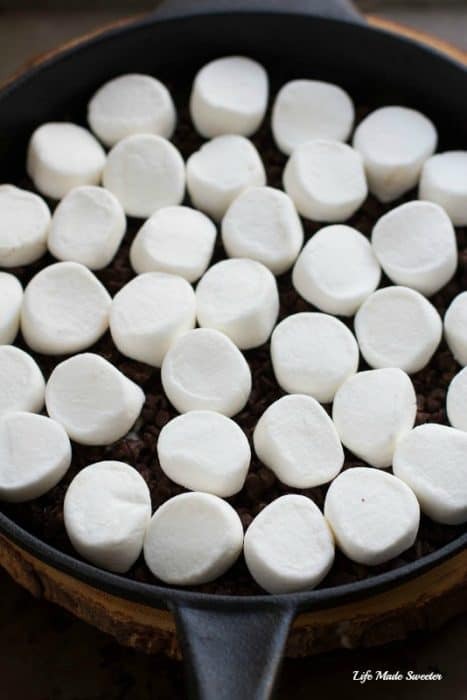 Bake until the tops of the marshmallows have browned. This can take anywhere from 5 to 15 minutes. Remove from grill and allow to stand for 3-4 minutes before serving with graham crackers for dipping. 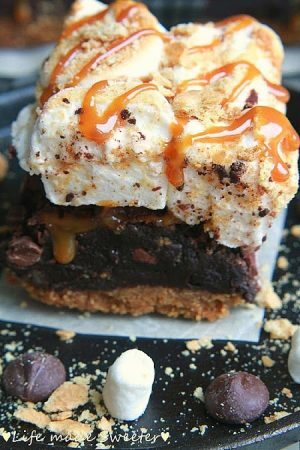 Best enjoyed immediately while still warm so the chocolate and marshmallows stay gooey.